For most New Yorkers, the places we truly love to eat are our best-kept secrets -- that food cart in Washington Heights doling out $2 arepas, that Crown Heights taco shop with no phone number, that Peking duck place with a B rating from the Health Department. And while oysters and pearls at Per Se are surely a worthwhile pursuit, there is a certain currency that comes along with knowing about the cash-only joint on 181st with the matzo ball soup. Maybe it’s about clout, and maybe it’s about frugality, or maybe it’s just about damn good food. It takes years of local intel, crosstown moves, and overdrawn bank accounts to gather an archive of these very spots -- these hidden, unassuming meccas of cheap, tasty, global eats. To spare you from a plate of E. coli-seasoned street meat in your quest for an affordable meal, we’ve compiled a few of our favorites to get you started. Long before the East Village was NYU undergrad territory, there was B&H. The staple Ukrainian diner, mustard-vinyl awning and all, has been serving challah, blintzes, and mediocre coffee since circa 1938 -- and it shows no signs of slowing. Often home to a smattering of solo countertop diners, or a lively crowd of post-bar revelers gathered over pierogi at one of the narrow spot’s six available tables, the place has become an institution in the neighborhood. The waitstaff is uncannily capable of remembering faces (and orders), so it’s likely that after your first plate of potato pancakes, you’ll be welcomed back with open arms. At Eddie Huang’s popular bao spot, the staff appears dressed for an impromptu shoot with a sartorial street style blog. Perpetual hip-hop blares in the dining room; the walls are plastered with stickers and graffiti tags; and bao, a standard Taiwanese street food, is served with blase finesse. The sweet-savory steamed sandwiches have amassed some serious popularity across NYC in recent years, but you won’t be disappointed by the tried and true basics at this East Village mainstay. Opt for the Chairman Bao -- an open face iteration of the OG, served with tender, fatty pork belly on a sweet, pillowy bun, topped with a wealth of Haus Relish, crushed peanuts, and Taiwanese red sugar. Perfectly filling, never greasy, and balanced in flavor, this is the ideal on-the-go meal. For most New Yorkers, Indian food consists primarily of basmati rice and tikka masala dishes -- but the country produces a wildly impressive range of cuisines that most Westerners would not recognize on a take-out menu. Bengali is among those wonders. While you may be familiar with your basic array of Bengali tandoori dishes, among the most popular street foods in the region are kati (meaning skewer) rolls. Somewhere between a burrito and a shish kebab, the kati rolls at this single-item vendor can be treated as a sit-down lunch, an on-the-go snack, or a late-night energy booster for post-party college students. All the meat and peppers are grilled to delicate, charred perfection on skewers before being rolled up in an unleavened flat bread (paratha), and topped with egg, lentils, spiced potatoes, beets, and plenty of other tasty add-ons. We recommend you go for the chicken tikka roll, stuffed with tenderized blackened chicken in a spicy, creamy masala sauce, balanced with a light, sweet yogurt, and wrapped up inside a flaky butter paratha. For finger food, it’s got a pretty complex flavor. Punjabi is easy to underestimate as a run-of-the mill bodega. Beyond its nondescript storefront lies a narrow space jammed with hungry customers awaiting made-to-order Punjabi dishes at any hour of the day or night. There is no seating, but you’ll probably want to scarf down your samosas and thick, hot, perfectly seasoned daal before you leave the counter, anyway. The menu is lengthy, and enormous portions of food are packed into flimsy styrofoam containers -- think mountains of saag paneer and chana masala with bread and yellow rice. Opt for any two of the spicy, authentic vegetable dishes with a hefty stack of the warm, house-made roti bread, perfect for sponging up excess curry. In 2009, Hong Kong’s Tim Ho Wan was the cheapest Michelin-starred restaurant in the world. The dim sum specialists expanded across Southeast Asia and Australia before finally landing in the United States in 2016. The simple dishes at the East Village outpost are every bit as delicious as those at the original location, 8,000 miles away. Basic menu bites pack a serious flavor punch. You’ll find baked BBQ pork buns, round wooden trays of steamed shrimp dumplings, and bricks of moist sticky rice wrapped in lotus leaves. For a taste of what rocketed Tim Ho Wan to fame, order the braised chicken feet. The glistening mound or poultry arrives soaked in a pool of house-made abalone sauce and garnished with sliced roasted peanuts. Enjoy your feast -- it’s not often that you sample Michelin-starred food for less than $5. Tucked a block off of Bowery on Chrystie Street stands Wah Fung No.1. Like most underrated, exceptional Chinatown eateries, the place is nothing special from the outside. Through the front window, you’ll see a curtain of hanging Peking ducks, behind which a team of chefs is working away. The shop is scarcely large enough to fit its short line of devoted locals, and cash is exchanged for styrofoam containers over the counter at breakneck speed. Come here for the signature pork over rice entree. The staple take-out dish comes packed with a generous helping of steamed white rice, topped with a mound of soy-marinated ground pork drowned in sweet, brown sauce -- all of which runs you $4. It’s a whole meal for less than what many places charge for a cold brew. Amid the endless fast-casual pizza joints on Bleecker Street lies a slice shop that is not quite like the others. Here, chef Ziyad Hermez serves manousheh -- a Lebanese street food akin to a Middle Eastern flatbread pizza -- with all the rhythm of Joe’s Pizza, just down the street. With toppings like ground lamb and hummus, or house-made clotted cream, rose water, and honey, the chewy tricked-out pizzas are a local favorite. There’s nothing on the menu we wouldn’t recommend sampling at least once, but we advise you start out with the za'atar manousheh. Topped with a simple (but wildly flavorful) blend of dried thyme, sumac, sesame seeds, and dense olive oil, this is the perfect cheap eat. With a frayed brown awning and nondescript entrance, Mamoun’s is easy to miss among its famed West Village neighbors, which include Caffe Dante and JG Melon. But in spite of its dingy facade, there’s often a line that stretches out the door and up MacDougal Street. Established in 1971, founders claim this is the oldest falafel joint in New York. Today, the eatery has just three tables, a narrow countertop, and a maximum occupancy that rivals a toll booth. Pita sandwiches are distributed rapid-fire to crotchety West Village natives, post-party finance bros, and local celebrities. Whether you prefer house-made hummus, sticky baklava, or chicken shawarma, your meal will come in a plastic yellow tray -- no frills, here. Stick with the classics, and try the falafel sandwich -- a pocket of warm pita bloated with diced tomatoes, fresh lettuce, spiced falafel, and the spot’s famed white sauce, finished off with a healthy serving of baba ganoush. That’s a one-two punch of food for just a few bucks. Dirty water dogs, doughy pretzels, deliciously downmarket coffee -- whatever they’re whipping up, street carts play an essential role in the NYC dining scene. And halal hawkers are among the most celebrated of our mobile food purveyors. 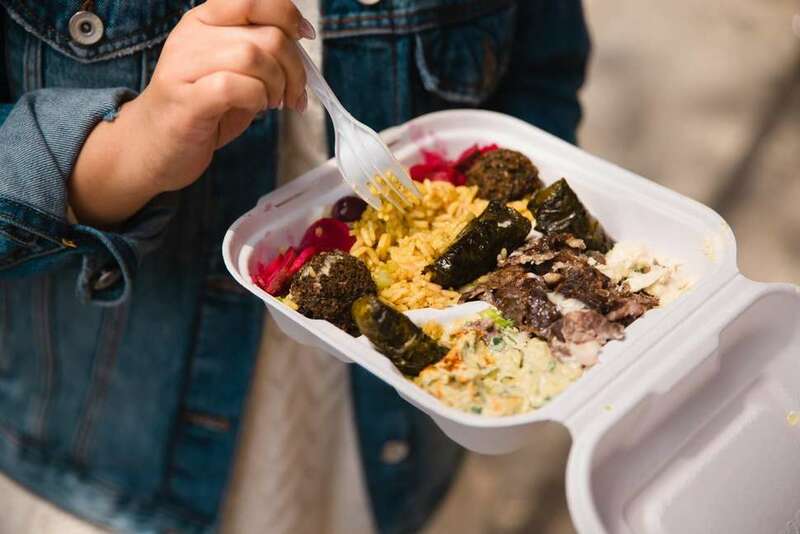 You’ll find a slew of street-side vendors dishing up hefty portions of rice and halal meat drenched in addictive white sauce on virtually any Midtown corner. The best of the lot may very well be Sammy’s Halal in Greenwich Village. Stop by midday for a warm, thick pita, piled high with a mountain of marinated chicken and cooked onions, chopped lettuce and tomato, and a magical combination of hot sauce, green chile sauce, and that famed creamy white sauce. For many NYC millennials, traveling above 14th Street is something of a city-kid faux pas. The Upper East Side -- home to multi-million-dollar co-ops and their wealthy inhabitants -- is an atypical hang-out for young folk. That said, even in the land of Gracie Mansion and The Plaza Hotel you can find good cheap eats. The best of it comes from Ethyl’s. Helmed by chef Paul Gerard (a member of the select group of native New Yorkers who can truly claim to have lived in Brooklyn before it was cool), this place has a gritty 1970s vibe. A disco ball spins overhead, a DJ typically occupies the corner stage, and the red-and-black walls are lined with framed photos of rock legends and pornstars from days gone by. Depending on the day (or night), you might catch go-go dancers strutting along the bar, a stand-up comic’s act, or a trivia game in full swing. At lunchtime, however, there should only be one thing on your mind: the Fi-Dollar Burger. Yes Fi, and no the price tag is not a sick prank -- the burger actually costs $5. The patty is thick, juicy, and topped with pickles and ketchup. It’d be irresponsible to encourage you to wash it down with a mid-workday beer, but psst! you should definitely wash it down with a $6 Budweiser. If you insist on a side order, a plate of fried pickles or the crab rangoon hot pockets should do the trick -- but trust us, the burger will be plenty. Gray’s Papaya is to the Upper West Side at Papaya King is to the Upper East -- and while hot dog fans continue to debate which is superior, Papaya King’s original combo remains a champion cheap meal: two franks hidden under a mountain of relish, onions, and sauerkraut, and the tropical drink of your choosing (pick papaya, obviously). Dating back to the 1930s, the dingy, colorful King is a beacon for loaded dogs loaded with sauerkraut, onions, relish, or rich, steaming chili -- in other words, a meal you can eat standing up that did not come from a vat of dirty water. All the best tacos come served on paper plates. You may thus find no better tacos than at the aptly named Los Tacos No.1 -- an unassuming Chelsea Market stall doling out tortilla chips in wax paper bags, and horchata in to-go coffee cups. The tortillas, available in flour or corn, are hand-made throughout the day, the pico de gallo is always fresh, and the signature guacamole is the stuff of dreams. And you can’t go wrong with the fillings. If you’re leaning towards tacos, opt for the smoky carne asada, the grilled cactus, or the marinated pork topped with grilled pineapple. The quesadillas are an easier decision: wolf down that pollo asado. For $4.50, help yourself to a dense, house-made tortilla, loaded with melted cheese and chunks of juicy seasoned chicken. Top it off with a helping of guac, and some of the specialty cilantro-heavy pico de gallo, and then wash it all down with a milky, semi-sweet horchata. It’s the kind of meal that makes Chelsea Market bearable. Unless you’re looking for a midday shot of vodka, Russian fare is not normally an obvious lunch choice. But there’s far more to the cuisine than clear liquor and borscht -- as evidenced by Teremok. New to the United States, the chain is a fast-casual staple across Moscow and St. Petersburg, serving up traditional Russian crepes called bliny. It’s like the International House of Pancakes, but with far more foreign intrigue on the menu than your standard stack of white flour hotcakes. These thin, savory pancakes, prepared with your familiar mix of flour, butter, eggs, and milk, are stuffed with just about every fixing you can imagine. Play it safe with Virginia ham and Swiss cheese melted together; try out a lox and sour cream combo; or go the whole nine yards and sample one packed with fresh cream and wild Alaskan salmon caviar. The best thing on the menu, however, is the slow-cooked chicken bliny with diced parsley and apple cream -- the perfect blend of sweet, savory, and hearty. The Lower East Side, like Queens, has a rich history as an immigrant haven -- so it’s no surprise that the area has one of the most diverse food-scapes in the city. Nowadays, it’s perhaps most notable for its post-frat population, but the international food culture remains. Patacon Pisao is a case in point. Velazquez’s Essex Street outpost has a modest appearance, with a narrow brick facade and a neon-wire sign flashing the restaurant’s name. Beyond the classic patacones, Velazquez serves handmade corn arepas stuffed with steak and egg, tacuchos (which fall somewhere between tacos and burritos), and best of all, tequeños -- delicate braids of dough and queso blanco, perfectly fried. And did we mention they’re just a couple bucks? Bagels and pizza are two of the most esteemed dishes in all of New York, with reputations heard ‘round the world -- which is why a pizza bagel is like a holy communion. And at a venue like Kossar’s -- a Jewish deli that has served as the New York spot for bialys since 1936 -- all menu items should be treated as sacred, then devoured. Somewhere between a bagel and an English muffin, a bialy is baked and slid out of the oven before the yeast has the time to fully rise, while a bagel is boiled then baked to its full doughy potential. And while the soft, chewy bialys are what earned the place its following, the brick oven-toasted bagels are truly excellent as well. Turn the breakfast staple into a solid all-day option and order the sauce-drenched, gooey mozzarella-topped pizza bagel with a paltry price tag. We declared your local bodega bacon, egg & cheese to be one of the most iconic foods in NYC -- but that doesn’t make it the best in the grand scheme of New York egg sandwiches. Next time you’re hankering for a BEC but you’re looking to avoid the questionable meat at your corner store, make your way to Cheeky’s Sandwiches. Their wisp of a blue-and-white exterior is as easy to miss as your usual deli. Inside, you’ll find bread and chicory coffee straight from New Orleans, house-made buttermilk biscuits, and airy, sugar-dusted beignets. Take a break from the bacon and stop by this quaint Orchard Street spot for the perfect breakfast sandwich: two fluffy scrambled eggs with melted Muenster cheese snug between two halves of a crumbly, warm buttermilk biscuit. It is not hard to find a shot-and-beer combo deal in a New York bar -- especially when you enter the beardy, well-charted territory of deep Brooklyn -- but how many come with a free hot dog as well? Among the most famous uptown dives, Rudy’s Bar and Grill is the answer to your dog-and-whiskey prayers. Open since 1933, Rudy’s was among the first New York City bars granted a liquor license when prohibition was repealed, and if you take a trip to the wood-paneled spot today, it doesn’t seem like much has changed. A giant bow-tie wearing pig statue stands guard at the door, the neon Rudy’s sign appears to be at risk of falling on any unfortunate passerby, and the bar is sticky with several decades of spilled liquor. This is, of course, part of its charm. Drop in here for your next beer-and-a-shot fix, and chase that whiskey down with a complimentary hot dog. You’ll be grateful in the morning, we promise. In New York, there is a deli for every occasion -- 24-hour spots for 2am chopped cheese sandwiches, corner stores for breakfast burritos, famed Jewish mainstays for pastrami on rye, and local bodegas for emergency recycling bags. Bodegas tend to maintain a sense of personality. No two are identical. Positioned on the corner of Thompson and Prince, M&O is just as unassuming as its counterparts. But beyond the utterly unsexy rust-colored awning, and the dim neon Corona sign, the place delivers some of the best sandwiches in SoHo. The deli counter serves excellent pastrami (though Katz’s nearby shop has the monopoly on that one), truly indulgent chicken Parm, and most importantly, a perfect BLT. On a classic kaiser roll topped with house-made mayo, a wealth of crunchy bacon strips, tomato, and fresh lettuce, the sandwich hits all the marks: crunchy, salty, buttery, and strangely refreshing for a food item built primarily of bread and bacon. And most importantly, in the land of Marc Jacobs and Balthazar, it’ll run you all of five singles. Pizza is to New Yorkers as wine is to the French: a delicacy and a right. Whether you’re talking local dollar slice joints, sit-down Italian spots, or neighborhood mainstays, it’s an essential truth of life in the city that New York pizza is the best pizza. Some attribute the inimitable flavor to our water, others to generations of Italian immigrants guarding the keys to the perfect sauce -- but regardless of the reason, NYC pizzerias are a local institution. And while you’re surely familiar with cocktail-serving Brooklyn joints like Roberta’s, and long-standing neighborhood cornerstones like Joe’s, it’s less likely that you’ve made the trek to East Harlem for a slice of Patsy’s Pizza. Open since 1933, the restaurant is emblematic of the finest pizza establishments in the city: small, greasy, and simple. The pizza, however, is none of these things. Among the only venues in the New York serving coal oven pizza by the slice, the stuff is delivered with a charred, blistered crust, a wealth of house-made red sauce, and milky globs of aged mozzarella. Served in classic white paper boxes, each slice still only costs just $1.75, while a full (enormous) pie will cost you $12. Each is plucked from the ancient, smoking oven right in front of you while you chat with the gruff, white-haired, cornmeal-dusted man at the counter. We respect your allegiance to your corner pizza shop -- but every New Yorker should eat a slice at Patsy’s at least once. In Latin America, empanadas are the principal street food -- fried, flakey dough stuffed with all manner of seasoned meat, cheese, and vegetable. Empanadas Monumental is just about as close to the real thing as you can find in New York. The place is a crowd favorite for pockets of ground beef and shredded chicken with locations throughout Uptown, the Bronx, and Queens, and recipes sourced from the Dominican Republic. Beyond classic combos of seasoned meat and melted cheese empanadas, Monumental stuffs pastry pockets with things like “pizza” (red sauce and mozzarella), Philly cheesesteak, and sweet plantains. They’re cheap, quick, and easy to eat on the go. Opt for the rich, meaty, eggplant and chicken-stuffed empanada. If you’re still hungry when it’s gone, try the sweet guava and cheese for dessert. Once upon a time, Washington Heights was home to the good ol’ Mets, the (now) San Francisco Giants, and if you can believe it, the Yankees. And while all three teams have graduated from the Uptown stadium to which they owe their humble beginnings, there are still plenty of reasons to visit the area: namely, the Salvadoran food. While the center of Manhattan lacks Salvadoran flavor, areas like Corona, Flushing, Bushwick, and Inwood regard the Central American fare as a staple -- and some of the best comes from La Cabana Salvadoreña in Washington Heights. The casual spot serves an enormous all-day menu of fresh juices and egg plates (think huevos con chorizo piled high with tortillas and crema), alongside hefty seafood and grilled beef lunch specials, and most importantly, world-famous pupusa. Like a cross between a falafel sandwich and a sweet corn cake, the traditional dish is composed of a thick doughy masa tortilla, slightly sweet and rich, stuffed with a savory filling like mixed pork and cheese, or spinach. Each pupusa at the authentic, unassuming spot is so cheap, you’ll want to grab a couple. Sometimes you’ll find yourself waking up well after noon, bleary eyed and not sure whether you’re you’re still buzzed or just hungover. Maybe you overdid it on Super Bowl Sunday or you had to finish a bottle of vodka before it went bad, but in either case, the best detox is a retox. Chase your hair of the dog with some complementary carbs at the Alligator Lounge in Williamsburg. The classic, spacious sports bar is an easy go-to for game-viewing of any kind, but even better than the array of screens, and the enthusiastic cast of North Brooklyn sports fans, is the food and drink situation: with the purchase of a $4 beer, you’ll get a free personal pizza. It might just be enough to walk back the damage you did last night. Franken-food mashups have taken the city by storm in recent years -- Cronuts, ramen burgers, turducken -- but the latest to the scene is the croissant-bagel hybrid (cragel) from Scot Rossillo. Made famous by the rainbow bagel, Rossillo’s Williamsburg bagel shop produces endless doughy creations that are nothing short of visionary (think pink bagels topped with edible glitter and Jameson Irish whiskey St. Patrick’s Day bagels). When it comes to breakfast sandwiches in particular, there are no more perfect gluten vehicles than bagels and croissants. Lucky for you, you no longer need to choose! The cragel marries the foundation and manageability of a classic bagel with the flaky, buttery texture of a croissant. Order one piled high with scrambled eggs, melted Cheddar, and two crispy slices of bacon without breaking the bank. Although it’s a relative newcomer to the NYC soul food scene, Smith Street’s Wilma Jean is the real deal. One-third of a local mini-empire created by Robert Newton and Kerry Diamond (Nightingale Nine, Smith Canteen) the place is casual, comfortable, and as quick as you make it. The fried chicken, once declared some of the best in the city, is meaty, dense, and perfectly crispy; the shaved collard greens are smooth and buttery; and you might catch yourself chatting with a local at one of the cozy dining room’s communal tables. We dare you to take a trip to Wilma Jean without ordering a plate of the famed fried chicken, but if you’re passing through on a budget, you can’t do better than an order of the $5 house mac & cheese. Made with gooey, melted Vermont white Cheddar, and topped with toasted panko crumbs, the heaping side hits the perfect smooth-to-crunchy balance. And a single order will leave you plenty satisfied. David’s has had many cultural associations over its decades in Brooklyn. Founded as an authentic Jewish deli, the place is now manned by a Yemenite Muslim. And throughout its shifting cultural allegiances, pastrami on rye has remained the Bed-Stuy counter joint’s most popular item. It may seem foolhardy to order anything but red meat in a place named for brisket, but the turkey burger at this Nostrand Avenue spot is lunch’s best-kept secret. A healthier alternative to your traditional beef, the turkey burger comes with shredded lettuce, fresh sliced tomato, and a drizzle of ketchup and mayo, all sandwiched between a toasted bun -- and it’ll fill you up without requiring a midday digestion nap. Eliza Dumais is a writer who will graciously accept any free food you'd like to send her way. Follow her @elizadumais.